The flow of energy through an ecosystem is called ecological energetic. Energy is the ability to do some work. The sun emits light and other types of radiation. Some of these radiations fall on the earth. The light radiation falls on some object. The Object absorbs light and become warm. Thus light energy is transferred into heat energy. Land and oceans absorb heat. It produces heat and cold areas on the earth. It causes flow of air and clouds. The source of energy on the earth is the sun. A small amount of the radiant energy is absorbed by the green plants. They change this energy into chemical energy in the form of glucose. All the other living organisms obtain this chemical energy from the plants. A large amount of energy is lost in the form of heat. Only a small part of the solar radiation is used during photosynthesis. This stored energy provides energy to living components of the ecosystem. Green plants absorb blue and red part of the spectrum. However, only I to 5% of the absorbed energy is converted into food energy. The energy used once by an organism is soon lost in the form of heat. There is always one way flow of energy. The flow of energy through ecosystem follows laws of thermodynamics. It has been estimated that about 57% of the solar energy is absorbed in atmosphere. It is scattered in space. About 36% is absorbed by water or land. About 8% falls on plants. 80 to 85% is absorbed by green plants and rest of it is reflected. About 50% of the absorbed energy is used in photosynthesis i.e. it is stored in the form of potential energy of organic compounds of green plants. 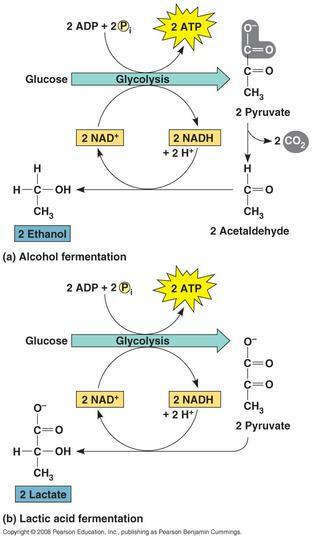 (a) Gross primary productivity: The total rate of photosynthesis or the total amount of organic matter fixed is called gross primary productivity. It also includes the organic matter used up in plant respiration. The amount of energy available •to other trophic level i.e. the heterotrophs or the consumers is called secondary Productivity. 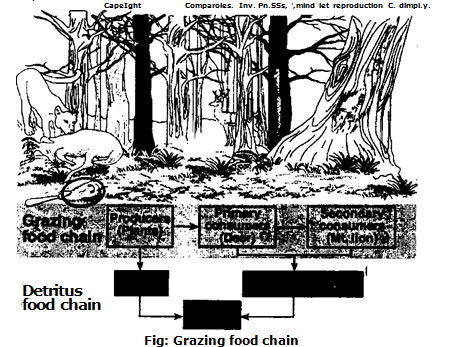 I. Grazing Food Chain: It is found in the terrestrial ecosystem or fresh water ecosystem. It has a plant or photosynthetic algae at the base. It goes from smaller to larger animals. Grassland: The food chain of grazing ecosystem consists of grasses. grasshopper. frog, snake and owl. ecosystem: The food chain of fresh water ecosystem consists of algae, water fleas, small fish, large fish and a fish eating animal, bird or man. 3. Saprophytic or Detritus Food Chain: It is a type of food chain in which decomposers like fungi and bacteria attack dead remains of plants and animals to obtain food. Fourth trophic level: Fourth level is composed of tertiary consumer. Some animals can eat plants as well as smaller animals. Therefore, they are called as Omnivores. Thus it occupies more than one trophic level in the food chain. In grazing food chain of grassland, grass may be eaten by muse. The mouse may be eaten directly by snake or hawk. The snake may also be eaten by hawk. Similarly, grass may also be eaten by grasshoppers. Grass hoppers are themselves eaten by frog and frogs are eaten by snakes. There are varieties of pathways in a food web. These pathways maintain the stability of the ecosystem. For example, owls prey on rabbits and mice. If a disease reduces the rabbit population, a fewer plants are consumed. The larger plant population produces more fruits and seeds. Thus these plants support a larger mice population. The increased number of mice becomes the major food source for the owls. The rabbit population gradually increases, and these primary consumers again become a food source for the owls. Thus nature maintains a balance. The pyramid Which shows the relationship between the number of producers, herbivores and carnivores at successive trophic levels is called pyramid of numbers. 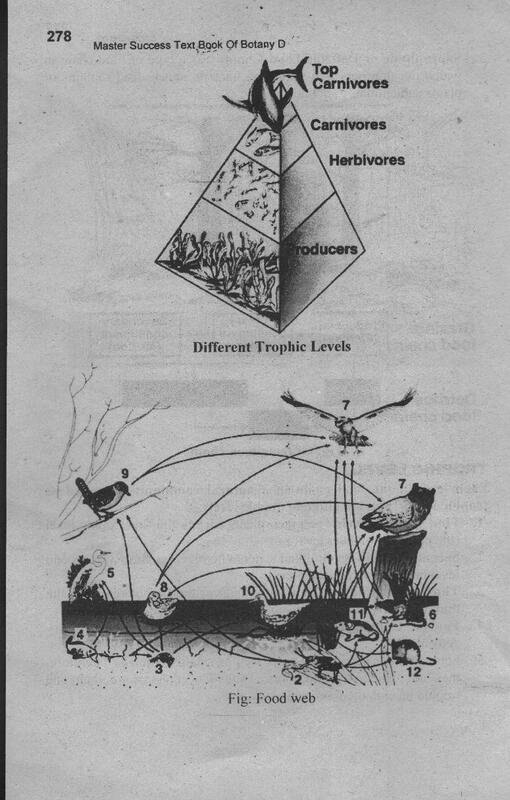 The number of individuals in each trophic level can be shown with the help of pyramid. The wide base of pyramid represents the producers. The plants are highest in number. The number of consumers of different types decreases further. (a) Pyramids of the grassland: The number and species of producers like grasses, herbs and forbs are largest in number. Primary consumers or herbivores—like grasshopper, rabbit mice etc. They form the second largest number. But they are lesser than the producers. The snakes and lizards are lesser in. number than the primary consumer. (c) Pyramids of the aquatic, ecosystem: The base trophic level is occupied by large numb_et of producers called phytoplankton. These are algae, diatom and other hydrophytes. Second trophic level is occupied by lesser number of primary consumers or herbivores. 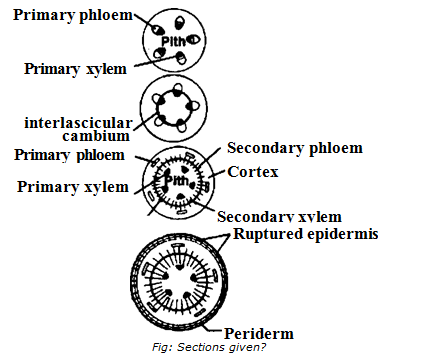 It consists of zooplankton and smaller herbivorous fishes and rotifers. Secondary carnivores like ‘fishes eating each other. Finally the tertiary consumers comes which are in smaller numbers. Thus the number of organisms decreases from base of the pyramid to the apex. 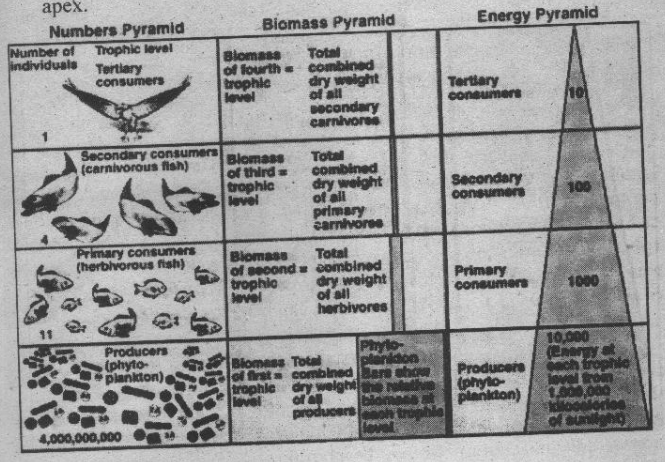 The pyramid which shows the relationship between the biomass of producers, herbivores and cirnivores at successive trophic levels is called pyramid of biomass. The living weight of the organism is called biomass. The biomass of different trophic level also indicates the decrease of biomass in each trophic level from the base to the apex. In the terrestrial ecosystem total biomass of producers will be highest. But the biomass of the organism decreases from producers to the top carnivores. The pyramid which shows the relationship between the energy successive trophic levels is called pyramid of energy. Solar energy is trapped by producers during photosynthesis. It is Converted into chemical energy. This energy flows in the food chain from the producers to the top carnivore. It decreases at successive trophic levels. This can be shown by the pyramid. 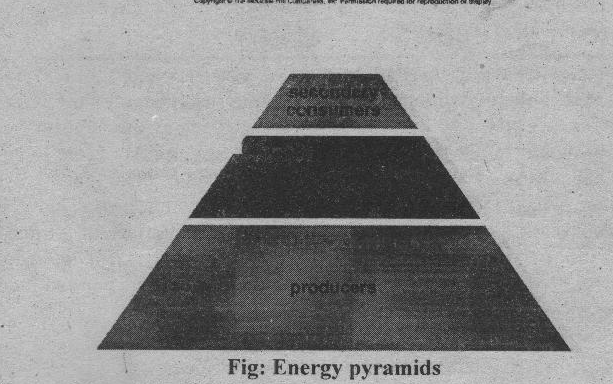 The base of pyramid shows energy utilization at the producer level. The apex shows energy utilization by the top carnivores.